Join us for the best fundraiser of the year! 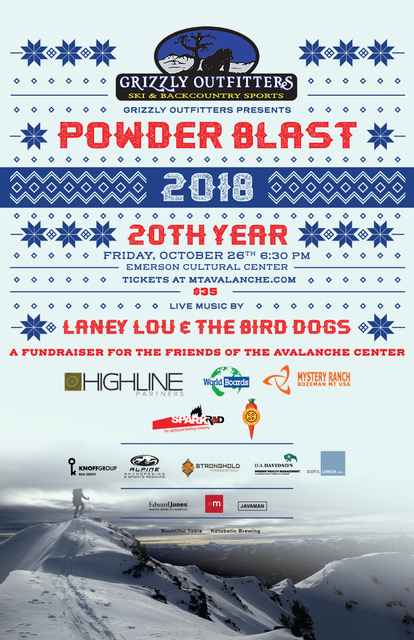 All proceeds benefit the Friends of the Avalanche Center which supports avalanche awareness, education and information throughout southwest Montana. Your $35 donation gets you an unforgettable evening at the Emerson Cultural Center. Grizzly Outfitters of Big Sky is title sponsor of this year's 20th Annual Powder Blast. Mystery Ranch, World Boards, Community Food Co-op, Highline Partners and Spark R&D are key sponsors along with Alpine Orthopedics, Stronghold Fabrication, Werner Wealth Management, Scott Lawson Dentistry, and Knoff Group Real Estate. Additional support comes from Javaman, Edward Jones, Massive Design, Bountiful Table and Katabatic Brewing. Music by Laney Lou and the Bird Dogs and the best silent auction of outdoor gear in the valley!